"Apart from being passionate about science I am also a mother. I realize how little time we have in our busy lives to play with our children. Therefore, none of the 'games' (or experiments!) should require more than one hour to complete." This is a fun and exciting book for children to explore the world through - while standing in the kitchen with mom or dad. Up We Grow! 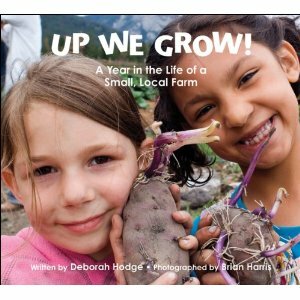 : A Year in the Life of a Small, Local Farm is a new release from Kids Can Press. If you and your family like to eat local - then this is a book that will be of incredible interest to you! Up We Grow! takes you through Spring, Summer, Fall and Winter on a small farm not too far outside of city limits. This is a rather lengthy picture book that offers a great deal of detailed explanation as to what you can expect to find on a farm during the various seasons. We meet the group of farmers who tend this farm and see how they tend to the land the animals together. As their various jobs are explained, the children are asked questions such as, "Which job would you like best?" As I read this book I couldn't help feeling like it was the PERFECT book to read before a field trip to a farm. I love the full-color photographs which illustrate this book and help bring the farm to life. Up We Grow! is a celebration of the local farm and, I think, an impressive and amazing book. I have a feeling we'll be revisiting this book several times over throughout the years, as we have so many local farms and do our best to eat local whenever possible. Excellent resource, this one! Now for the good news -- I have a copy of I'm a Scientist: Kitchen and Up We Grow! to give away to one of you, courtesy of DK Publishing and Kids Can Press. To win? Simply leave a comment below. This contest will remain open through Thursday, September 9th. Oh, goody! I get to be first to enter. These both sound excellent! We visit a farm when we see my husband's grandparents-several times a year. That combined with our recent amazing volcano would make this a fun win! Both of these books look like a lot of fun! I have a 3yr old granddaughter going on 36 (according to her) that would love this book. I would love to have these for my daughter! Would like to be entered. thanks for the giveaway! I love science and I hope my boys find it as fascinating as I do. :-) Thanks for hosting this giveaway! These would be great additions to our homeschooling library! Happy early birthday to you! My girls and I would greatly enjoy these books! Thank you! My kids love these types of books! Thanks for the opportunity to enter. I would love to be entered. I plan on homeschooling, so I'm getting a head start on books that would be useful. Both of these books look fabulous! We would love to win this book! Both of these books sound great! both books look wonderful thanks for the chance to win. My boys would absolutely love this book. I'd love to be entered in the giveaway! This looks so cool! We love kitchen science and I know Jordan would be all over this. Sound like great homeschooling resources to me! These look great, Carrie! Sign me up! Both of those books sound like they would be great for my preschoolers. We get our milk from a local farm and I'd love for them to have more of an idea of what really goes on there. My kiddos would love these books. We love to play in the kitchen! Sounds like a ton of fun! All these giveaways at once?? You rock! What an incredible giveaway!! Thank you for the chance to win these books! My nephew would really enjoy these books because he loves science and getting his hands dirty. Again another outstanding couple of books. My kids love experiments and anything hands on. Getting their hands dirty is the best thing in the world to them. I would love to read both of these books! I have a little boy who would love this. OK - this is my absolute favorite of all your gives, and you've got some good ones! I can so easily put these to use in our home"school" this year! I love how visually exciting DK books are, and I love the look of the small farm book. Both books look wonderful and fun! 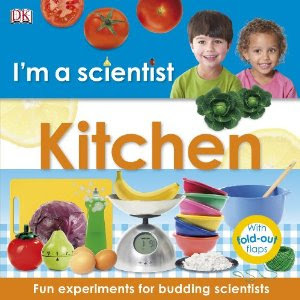 I'm especially interested in the I'm a Scientist: Kitchen book. We've just recently started participating in Science Sunday, a science for kids weekly meme and I'm sure this book would come in handy. This would be fantastic for our kids and little school.